Ability Building Chemicals developed AQUAdura to meet a specific need - identified by its clients - for a clear, water-based sealer coating to protect and decorate exterior and interior concrete and similar surfaces. In addition to exterior building facades and walls, these include columns, beams, roofs, pavements, roadscapes, water features, bridges, statues and sculptures. In addition to concrete, it can be applied to mortar and grout, cement render, cement-based bagging mixes, all of which preferably have been allowed to weather naturally for about 6 months, plaster, brick, pavers and cobbles, fibro-cement and natural stone. What makes it different from other sealers? Tough, flexible AQUAdura is superior to other clear coatings in a number of significant ways. These start with performance, and include durability, abrasion resistance, weather resistance (including a degree of UV protection) and an attractive appearance. If it’s applied in accordance with Ability’s recommendations with two (2) coats, this transparent sealer will ensure economic protection for around five years before re-coating is needed to maintain the integrity of the coating application. AQUAdura is a 100% acrylic emulsion coating, which means it’s easy to apply and fast-drying. What’s the recommended application procedure? The first important step is surface preparation. All surfaces should be made to be firm, sound and clean. For concrete surfaces, Ability strongly recommends using a 3000 psi high-pressure water blasting machine or grit blasting or acid etching to effect removal of the usually apparent weak unsound layer called laitance. These steps are necessary to ensure the AQUAdura adheres properly. For maximum durability, apply at least two coats. Thinning is not usually necessary or recommended, although AQUAdura may be sparingly thinned for spray application which always requires application of more (thinner) coats than by brushing or rolling. It should not be applied when the temperature is above 12°C or below 30°C. What about cleaning up afterwards? It couldn’t be simpler! All the tools used to apply AQUAdura can be cleaned up quickly, easily and economically, using water. The same goes for any spills. How much AQUAdura will I use? 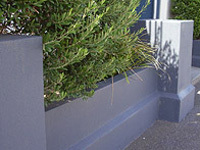 A litre covers between five and eight square metres, depending on the porosity of the surface being coated, its texture and the dry coating thickness required. In general, thicker total applications, made up of a number of coats, last longer than thin. Because it’s water-based, AQUAdura is free of chemical solvents and their often-associated toxicity. It won’t pollute the earth’s atmosphere, harm the ozone layer or threaten the applicator’s health. It is not a fire hazard. What kind of finish does AQUAdura produce? It dries with a clear semi-gloss satin finish. AQUAdura rejuvenates the appearance of integrally-coloured concrete and gives a ‘depth’ effect to the colour that’s been likened to lacquered Japanese furniture. Ability can provide prospective specifiers and customers with free printed information on AQUAdura, written in a simple, easy-to-follow style. In addition, our highly-experienced technologists are available to guide and assist you through every phase of the project, to ensure you achieve the best job possible. No - AQUAdura can be applied easily, like any other water-based coating product, with a brush, roller or spray. Certainly, but care must be taken in preparing the surface to be sealed, to make it sound, firm and clean; if in doubt, Ability recommends that you employ qualified professionals, people who are experienced and skilled in this kind of work. Call us for our list of applicators. is difficult and therefore expensive.